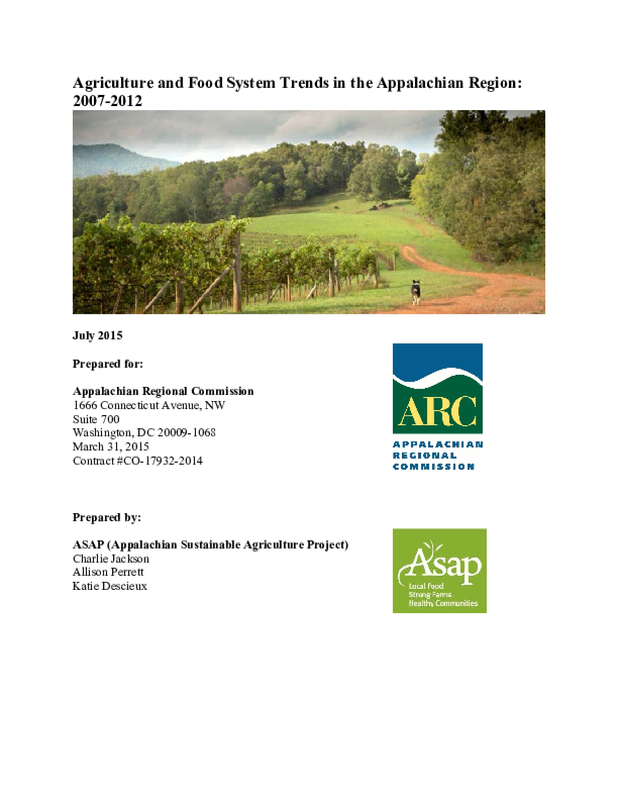 This data brief was produced by Appalachian Sustainable Agriculture Project (ASAP) for the Appalachian Regional Commission (ARC) to establish baseline data on trends in local food systems in the Appalachian Region. The tabular and graphic contents of the brief show trends in the Region's food and farm sector between 2007 and 2012, including comparisons between regional and state groupings of counties, ARC counties to their relative states, and the Appalachian Region to national statistics. The purpose of this brief is to provide an overview of trends in data; it is not an analysis of the causes or potential effects of changes over time. All data for this report come from the U.S. Department of Agriculture (USDA), National Agricultural Statistics Service (NASS) Census of Agriculture. The Census of Agriculture provides a crucial source of information on national agricultural trends, collecting uniform data at state and county levels every five years. Nevertheless, the Census of Agriculture is limited in that it does not provide contextual, qualitative information to explain data trends particularly at smaller local and/or regional scales. Therefore, the data in this document should be viewed in light of this limitation - it is just one source of information that can be used to document changes in agriculture in the Appalachian Region.